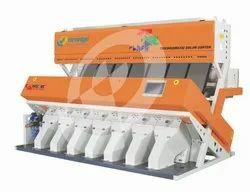 Offering you a complete choice of products which include Gram Sorting Machine such as White Peas Sorting Machine, White Double Beans Sorting Machine and Peanut Sorting Machine. We are in this business last 16 years and have grown from small 60 channel machine manufacturer to today with machines that can give throughput of 6 to 8 Tons. Orange is the only company in India in this Industry to have recognition from Govt of India for the Best R & D Facility and we are accredited by DSIR.